A home-grown national electronic HIV database has been launched by the Ghana AIDS Commission (GAC) in Accra. The online database, known as the Ghana Key Population Unique Identification System (GKPUIS), is to transform the data management processes of HIV prevention, treatment and care services for the key affected populations in Ghana. It was designed and developed by GAC with technical assistance from IT company‒ West Blue Consulting. GKPUIS platform, which has also been developed with advanced technology, is a secured centralised HIV and AIDS information system. At the official launch in Accra, the Acting Director General in-charge of Ghana AIDS Commission (GAC), Kyeremeh Atuahene, explained that the key feature of the system involves the generation of unique identification codes (UIC), based on predefined algorithm to uniquely identify each member of any of the key population sub- groups. “This system will, to a greater extent, minimize double counting and aid in estimating the size of various key population sub groups at hotspots,” he said. Additionally, he revealed that access to and use of the system is limited to only authentic users whose credentials and roles have been approved in the system by the commission. The system, he averred, is fully compliant with data protection and security regulations, adding that all users are to strictly adhere to confidentiality requirements. He further indicated that the system supports the generation of summarized reports to various programmatic indicators. Speaking on the theme for the launch dubbed 'leaving no one behind by reaching the unreached', Mr. Atuahene reiterated that the system seeks to manage data on services provided to all key populations and vulnerable groups. Touching on the activities of GAC, the acting director general of GAC stated that the commission seeks to live up to its mandate by ensuring that every Ghanaian who is HIV negative continues to live free of HIV while those living with HIV receive life-saving treatment and care services in a sustainable way. The Chief Executive of West Blue Consulting, Mark Addo, said GKPUIS is an excellent case study of using innovative technologies not only to address personalised healthcare delivery, but to assist with the secure and confidential management of personal health records for effective programme planning, monitoring and evaluation by the commission. He said the introduction of this system would improve efficiency of the commission's operations and assist in the long-term shared vision of meeting the Millennium Development Goals (MDGs). Deputy Health Minister Alexander K K Abban, who was at the launch of GKPUIS, expressed his appreciation to GAC and West Blue Consulting for working together to develop the online portal. 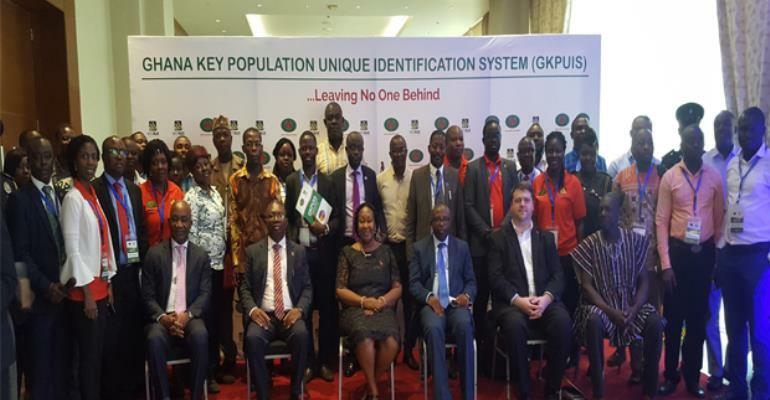 He said GKPUIS would contribute in no small way in ensuring that high quality data is captured with the objective of minimizing double counting and ensuring that collected and reported key populations data is clean and reliable. “We are confidence that all key populations organisations will find this system useful in capturing the required data about KP programming in Ghana and beyond,” Mr. Abban stated. Also present at the launch were the Presidential Adviser on HIV/AIDS, Dr. Mokowa Adu-Gyamfi and Dr. Michael Melchior, Country Director of CDC.